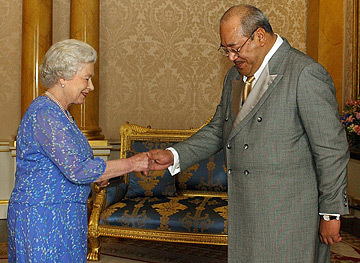 Britain's Queen Elizabeth II receives Tongan Crown Prince Tupouto'a at Buckingham Palace in London. The prince is now King Tupou V after the death of his father. NUKU'ALOFA, Tonga » Tonga's new monarch will sell his business interests in the South Pacific nation, the palace announced Friday, a move that could allay concerns among democracy activists that ties between commerce and royalty in the kingdom could breed corruption. "King Siaosi Tupou V has announced he will dispose of all his commercial interests in Tonga," said Lord Chamberlain the Hon. Noble Fielakepa, a noble assigned to the palace. The king has major holdings in an energy utility, a telecommunications company, an airline, fishing interests and a brewery, among others. Fielakepa said the power company divestment was almost complete, and the others would follow "as soon as suitable shareholding arrangements can be made." Pro-democracy lawmaker 'Akilisi Pohiva said last week that Tupou V must surrender his involvement in business to avoid a conflict of interest while performing his new duties. In the past, royals have been criticized for using their ruling power to enrich themselves. Meanwhile, plans for the late king's funeral were proceeding. Ambassadors and other dignitaries from 23 nations, from Great Britain to Japan and most South Pacific states, will attend the state funeral of Tupou IV on Tuesday, officials said. The capital, Nuku'alofa, is festooned with black and purple mourning cloth as Tongans from the outer reaches of this nation of 170 islands arrive to pay their respects to the late king, lying in state at the royal palace. Tupou IV, 88, died last Sunday at a New Zealand hospital following a long illness. He ruled for 41 years -- one of the longest reigns of recent times. Hundreds of mourners at the palace brought gifts of black tapa cloth, fine mats, baskets and flowers for Queen Halaevalu Mata'aho, who spends time each day sitting in a tent outside the entrance. During a month of official mourning, loud music and other entertainment, including dancing in bars and nightclubs, is banned. Despite the quiet, mourning has had an almost festive air as Tongans remember their king.